The steamship AUSTRIA was built for the Hamburg-America Line by Caird & Co, Greenock, and was launched on 23 June 1857. 575 Commerzlasten / 2684 tons; 318 x 39 x 28.10 feet (length x breadth x depth of hold); clipper bow, 1 funnel, 3 masts; iron construction, screw propulsion, inverted engines (twin cylinders), service speed 10 knots; accommodation for 60 passengers in 1st class, 120 in 2nd class, and 450 in steerage; crew of 80. 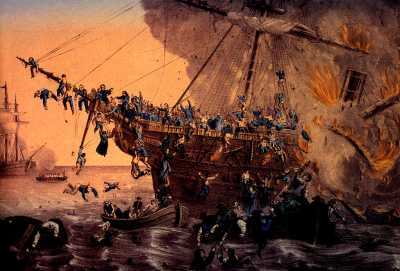 Contemporary print of the AUSTRIA on fire at sea, 13 September 1857. HAPAG-Lloyd, Hamburg. Source: Arnold Kludas, Die Geschichte der Deutschen Passagierschiffahrt, Bd. 1: Die Pionierjahre von 1850 bis 1890, Schriften des Deutschen Schiffahrtsmuseums, 22 (Hamburg: Kabel, c1986), p. 23. The AUSTRIA. Source: Noel Reginald Pixell Bonsor, North Atlantic Seaway; An Illustrated History of the Passenger Services Linking the Old World with the New (2nd ed. ; Jersey, Channel Islands: Brookside Publications), vol. 1 (1975), p. 349. Chartered by the British Government as an Indian Mutiny troop transport. 5 October 1857, sailed from Cork, but suffered severe storm damage in the Bay of Biscay, and forced to return to Plymouth; after a second attempt to sail was abandoned when her machinery broke, the British Government cancelled its charter. 1 May 1857, first voyage, Hamburg – Southampton – New York (2 roundtrip voyages). 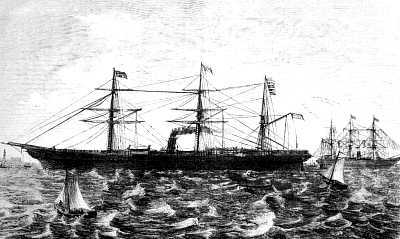 1 September 1857, sailed from Hamburg on her 3rd voyage to New York. 13 September 1857, about noon, in lat 45 01, lon 41 30, it was decided to fumigate the steerage by dipping a red-hot chain into a bucket of tar; the chain became too hot for the boatswain to hold, and he dropped it on the deck, which immediately burst into flame; although the ship was traveling only at half speed it was impossible to stop the engines as the engine crew had become asphyxiated, and when the helmsman abandoned the wheel, the ship swung into the wind, spreading the flames down the length of the ship. Sources: Arnold Kludas and Herbert Bischoff, Die Schiffe der Hamburg-Amerika Linie, Bd. 1: 1847-1906 (Herford: Koehler, 1979), pp. 24-25 (picture); Arnold Kludas, Die Geschichte der Deutschen Passagierschiffahrt, Bd. 1: Die Pionierjahre von 1850 bis 1890, Schriften des Deutschen Schiffahrtsmuseums, 22 (Hamburg: Kabel, c1986), pp. 22-23 (picture); Walter Kresse, ed., Seeschiffs-Verzeichnis der Hamburger Reedereien, 1824-1888, Mitteilungen aus dem Museum für Hamburgische Geschichte, N. F., Bd. 5. (Hamburg: Museum für Hamburgische Geschichte, 1969), vol. 1, p. 189; Noel Reginald Pixell Bonsor, North Atlantic Seaway; An Illustrated History of the Passenger Services Linking the Old World with the New (2nd ed. ; Jersey, Channel Islands: Brookside Publications), vol. 1 (1975), pp. 349 (picture) and 388. New York Herald, 28 September 1858, p. 1d; 29 September 1858, p. 1a; 15 October 1858, p. 1e; 23 October 1858, p. 1c; New York Times, 5 October 1858, p. 1; 23 October 1858, p. 1; Times (London), 15 October 1858, p. 10f. A list of 23 officers lost on the AUSTRIA is printed in the New York Times, 5 October 1858, p. 1b. Although the original crew list burned with the ship, the Staatsarchiv Hamburg contains extensive lists of surviving crew and passengers, compiled in the course of the official investigation of the disaster, and in conjunction with inheritance and pension claims by the families of the deceased officers and crew members.